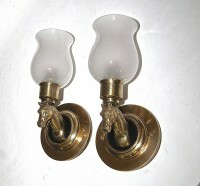 Pair of dimunitive polished and darkened brass horse wall sconces with matte glass shades. Rewired. Each sconce uses 1 – 40 watt max candelabra base bulbs. Later 4.5″ diameter brass backplates added for US installation.